I don’t have any particular favorite thing about keys. I love the character they carry, the stories they tell just by their shapes, their size, and their weight. I can picture so many different storylines for each one. I love how tiny they can be, tiny enough to hide up your sleeve. Some of them are so thin, I can’t imagine how they could be strong enough to turn in a lock. 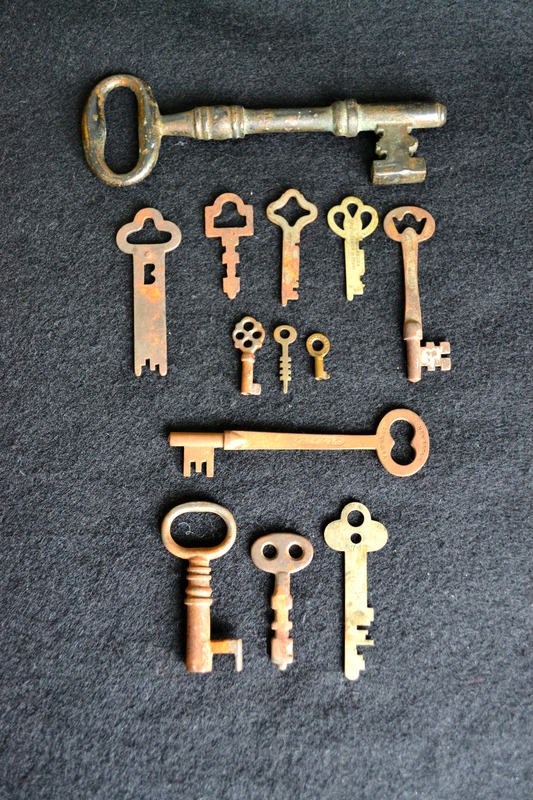 The horizontal-lying one towards the bottom is the one that happens to fit into the keyhole on my notebook (so cool!). For my book, I’ll be sketching my own key creations to create something original and fitting since they play such an integral part in the story. This entry was posted in Writing and tagged antique, author, authors, blog, book, books, inspiration, inspirational, keys, nanowrimo, notebook, novel, novels, objects, old, stories, story, video, writer, writers, writing.